Hebei, China? It's time to look closer. Update: Hebei, China? It's time to look closer. 200 km from Beijing, Hejian City has the political support for new infrastructure to guarantee massive new growth in the next five years. What's more, the new Hejian Industrial Park is to have an area reserved exclusively for remanufacturing. 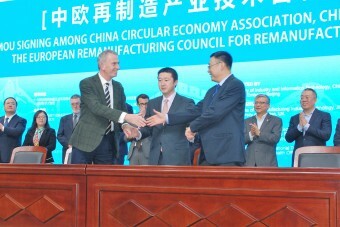 In mid March David Fitzsimons was in Hejian City representing the Conseil Européen de Remanufacture to sign three Memoranda of Understanding and to meet with friends from the recently reorganised National Key Lab which is to move to Hejian City from Beijing. Read his report and let us know what you think. And to see the news item as featured on China's national news, watch the video below!